Over a thousand years in the making, The Guitar has a history unrivaled by virtually any other instrument yet until now there has never been a university textbook in English to lead us through this labyrinth of information. But hidden in the shadows is a more critical aspect of that history  how the guitar was played and how we can use that information today. The application of historical information to our performances is the ultimate goal since every era, every country, and every composer and guitarist brought new insights to the instrument that we have inherited today as “The Guitar.” With over 150 musical examples and illustrations, Glise’s work combines historical details into an authoritative and readable textbook structured for a 1 or 2 semester university course on the history and performance practice of the guitar. Included are weekly listening, written, playing assignments and quizzes for non-music majors, undergraduate and graduate guitar majors. 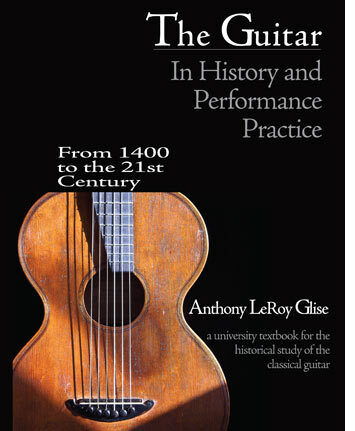 Below are links to the QuickTime® lecture slides that also double as student review for each chapter from Anthony’s “The Guitar in History and Performance Practice.” Anyone can access these for free. additional teaching aids including quiz answers, suggested handouts, etc. Slides auto-advance every 5 seconds. "Pause" the slide of you need more time to review the information.